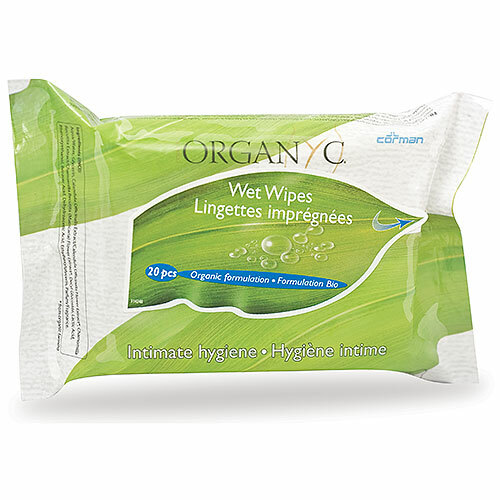 Organyc organic cotton wet wipes are made from pure organic soft cotton. The organic cotton used for the wet wipes is grown without pesticides and is natural and safe for personal use. The cotton wipes help to avoid irritation with the use of lactic acid which helps to stabilise pH balance. Organyc offer organic and natural feminine care from Sanitary and Maternity Wear to Beauty and Baby Care made using organic cotton wool to give softness, comfort and breathable products. Organyc products do NOT contain parabens, synthetic ingredients or SAP (Super Absorbant Polymers). Aqua, Glycerin, Calendula Officinalis Extract, Chamomilla Recutita Extract, Decyl Glucoside, Lactic Acid, Phenoxyethanol, Benzoic Acid, Dehydroacetic Acid, Ethylhexylglycerin, Parfum. The perfume included is natural parfum certified by ICEA. Below are reviews of Organyc Intimate Wet Wipes - 20 Wipes by bodykind customers. If you have tried this product we'd love to hear what you think so please leave a review. 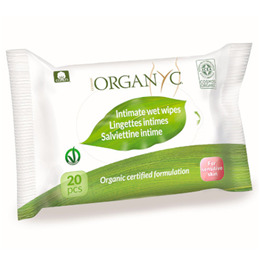 Organyc organic cotton wet wipes are made from pure organic soft cotton. The organic cotton used for the wet wipes is grown without pesticides and is natural and safe for personal use.